This episode: Gut microbes in mice break down plant foods and produce molecules that stimulate the immune system to resist influenza! Thanks to Drs. Ashley Steed and Thaddeus Stappenbeck for their contributions! Steed AL, Christophi GP, Kaiko GE, Sun L, Goodwin VM, Jain U, Esaulova E, Artyomov MN, Morales DJ, Holtzman MJ, Boon ACM, Lenschow DJ, Stappenbeck TS. 2017. The microbial metabolite desaminotyrosine protects from influenza through type I interferon. Science 357:498–502. What’s new: Now, Drs. Steed and Thaddeus Stappenbeck and colleagues, publishing in Science, have discovered how a certain microbe in the guts of mice helps protect them from influenza! What do I think: Why gut microbes so helpful? But too simplistic; how would effect be achieved via evolution? Complex but as always, take care of your microbes! Some patients get very sick, and others don't get sick at all, and you wouldn't even know that they had an active infection going on. And so we wondered if differences in the microbiome potentially could have implications for that human variation in influenza. This microbe's great at degrading flavonoids, so it's really great at that, and we picked a couple other microbes that are cousins to this particular microbe; similar but not identical properties. And they couldn't degrade flavonoids. 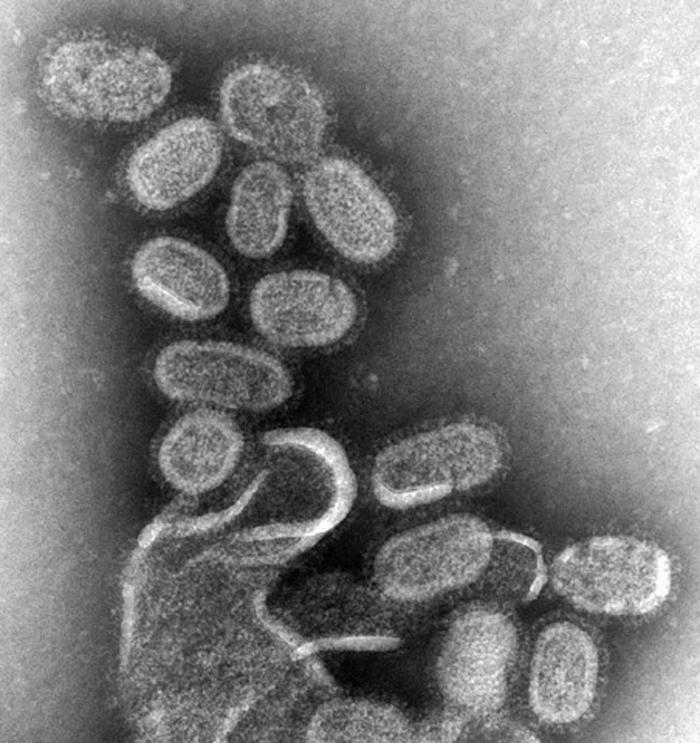 And then the exciting thing is when Ashley put these microbes into mice and then gave them influenza, it was the Clostridium orbiscindens species that could protect from flu, but not the others. So we screened a number of metabolites, 84 in fact, and we found one that reproducibly acted in that fashion, and that was desaminotyrosine. Desaminotyrosine didn't prevent the flu infection or didn't lessen it, the level of infection was basically the same. It was the consequences of the infection was really dampened by desaminotyrosine. Do you this there’s something specific about this particular species, or do you think there could be this same process throughout the genus? Well, in this study they did test another Clostridum, C. leptum, and it didn't degrade flavonoids, so it's not universal to the genus, but I doubt it's just this one species either, considering how much microbes trade genes around. I am currently taking my first microbiology class in college. We were task with finding a micro blog and following it throughout the semester and then writing about it. I have chosen your blog and I find it extremely interesting that a microbe could possibly have implications that could influence the way we treat flu and other infections in the future. I am just beginning my journey in microbiology, and look forward to learning how microbes effect not only our health but the well being on the world. Can you explain if the microbes that your blog entry speaks of are (or could be in the future) similar to the components of the probiotic supplements that are on the market now? Hi Zoe, welcome! Glad I could catch your interest. It's definitely amazing how microbes influence so many different things. I don't think there are any probiotic supplements containing the microbe from this episode (Clostridium orbiscindens). I did find one on the market that has a different Clostridium species, C. butyricum, which may or may not have the same ability. It would have to be tested. Most probiotic supplements and foods contain what are called lactic acid bacteria because they break down sugars and produce lactic acid, which gives yogurt and pickles their sour flavor. Species like Lactobacillus acidophilus, L. bulgaricus, L. plantarum, and also Bifidobacterium sometimes. But I think as studies show benefits from more different kinds of microbe, we could eventually see supplements or treatments containing more diverse mixes of different microbes, and maybe different mixes depending on the health benefit needed. It's exciting to look forward to! Please feel free to ask if you have any more questions, and good luck in your class! The recent flu outbreak has been in the news almost constantly for the last few weeks. Do you think there will eventually be a vaccine that will cover both types A and B equally rather than some of the vaccines that cover one or the other? I know, this flu season is getting pretty bad! Speaking from a US perspective (not sure if things are different in some other countries), most flu vaccines have been trivalent for a while, with two A strains and one B strain, but recently quadrivalent vaccines (with two A and two B) have been a lot more available, which is good.